Lavrion is situated 20 minutes SE of Athens airport. 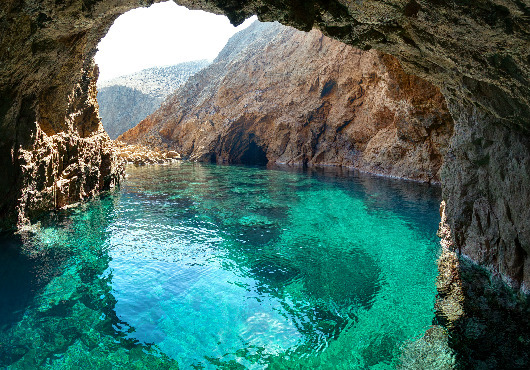 It is a convenient location to explore the southern Cyclades. 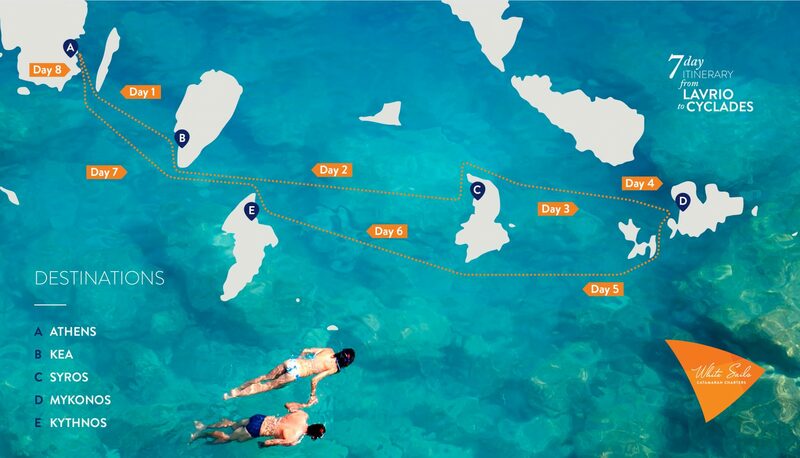 The total route of this itinerary is 146NM and 21 hours in total. Even if the check – in begins at 17:00, there is no need to spend the night at the marina. In a 7-day trip, every day counts. Take advantage of the evening and sail towards Kea. 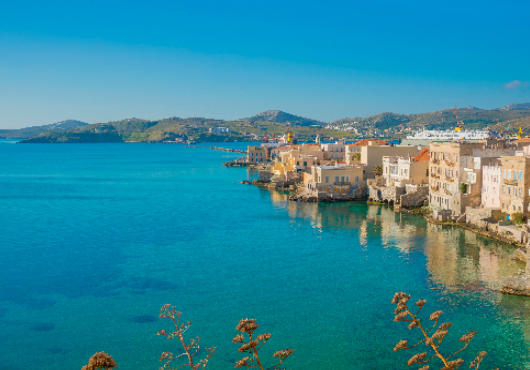 Kea is a small Cycladic island with beautiful beaches and a very picturesque town called Hore. 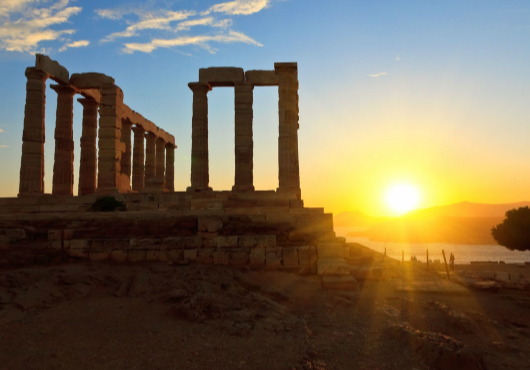 It is very close to Athens and is favored by Greeks for a quick weekend getaway. Anchor at Koundouros Bay or at the bay of Agios Nikolaos and the main harbor of Korissia. Alternatively, you could head towards Vourkari or one of the numerous other coves suitable for anchorage. Try one of the delicious taverns in the harbours serving freshly grilled fish among other appetizing dishes. 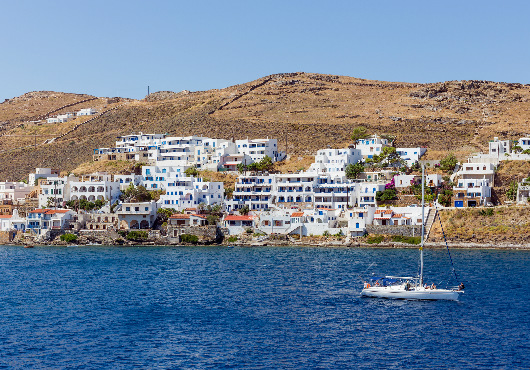 Sail past Kythnos and continue towards Syros. Anchor in the port of Kini, a picturesque fishing village with succulent sea food and fresh fish as well as magnificent sunset views featuring an incredible harmony of colours. At the small and quaint port many boats moor during the summer creating a beautiful searing for all visitors. 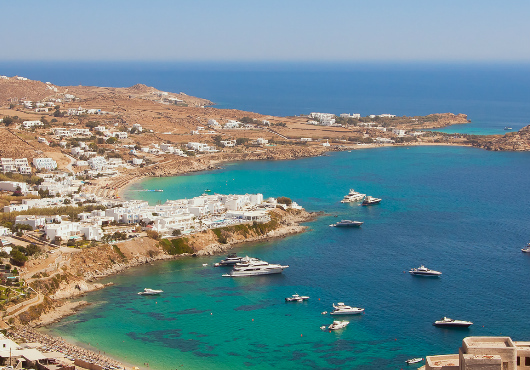 Depart early in the morning so that you can enjoy the whole day at the next stop, the amazing island of Mykonos. Spend two days at this beautiful island. 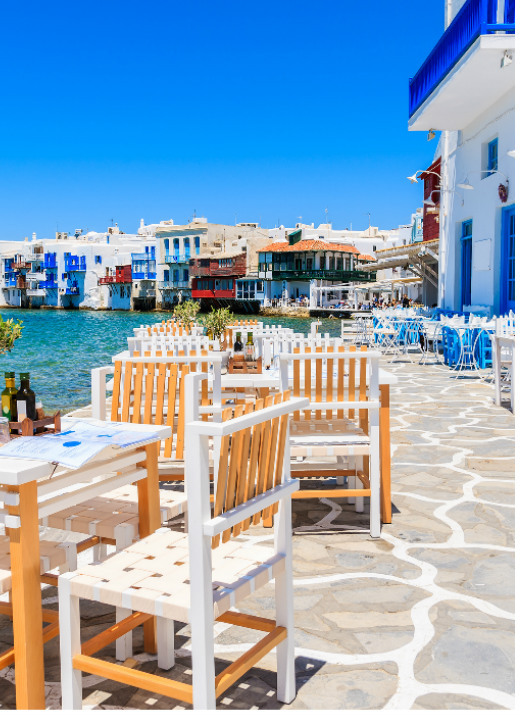 First thing you need to do is explore the town of Mykonos. 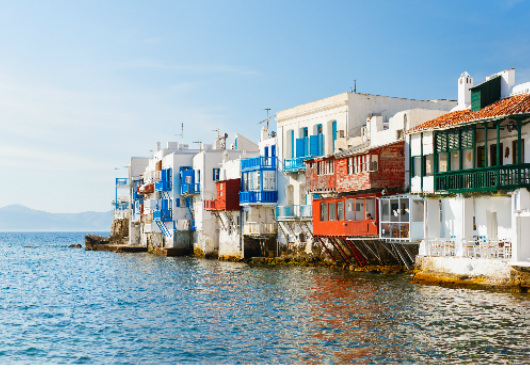 It is one of the most well-known islands in Greece, famous not only for its party loving nightlife but also its iconic white washed houses. Do not miss one of the most famous spots, Little Venice, named after the famous Italian city, build on the water, with the waves crashing on the house walls. 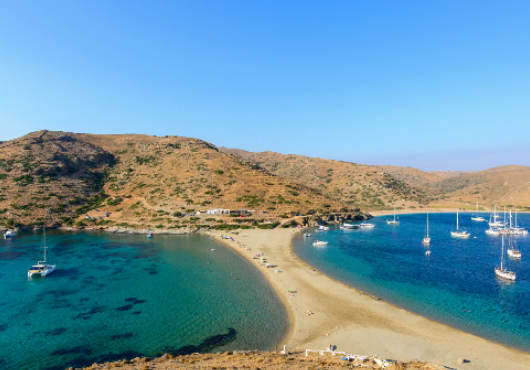 The second day of your layover at Mykonos, you can explore more of its magnificent beaches. Visit Psarrou beach, one of the most famous beaches in the world. Fancy water sports facilities such as scuba diving and jet skiing are available there. Enjoy your time and make sure you visit Nammos restaurant. 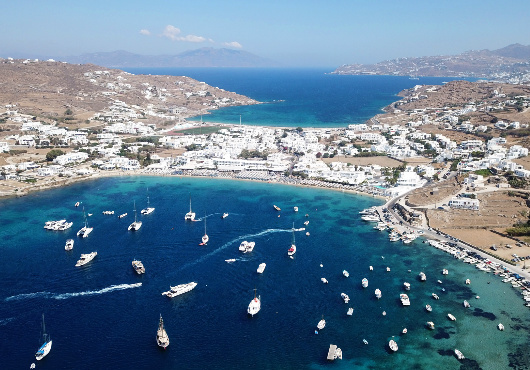 Sail back at the main port of Mykonos and explore the crazy nightlife of the island. 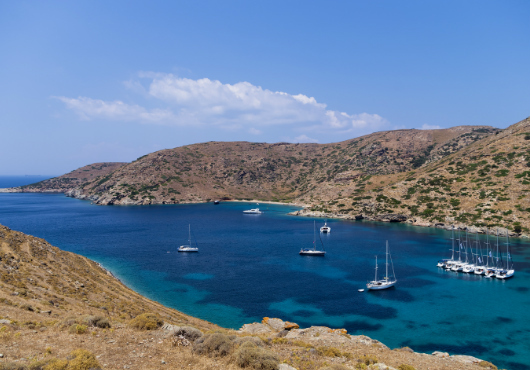 Sail past the narrow reef between the amazing islands of Delos and Rinia. 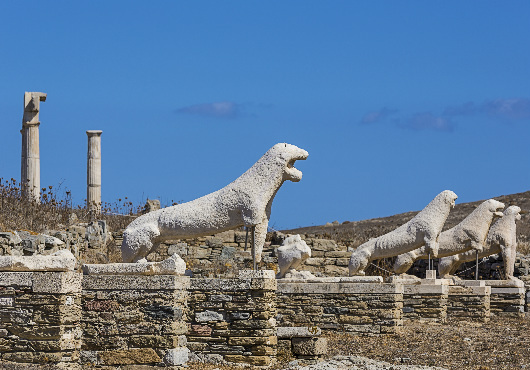 During your tour of Delos you’ll be impressed by the plethora of antiquities on the island. In fact, Delos is one of the most important archaeological sites in Greece and on UNESCO’s world heritage list. 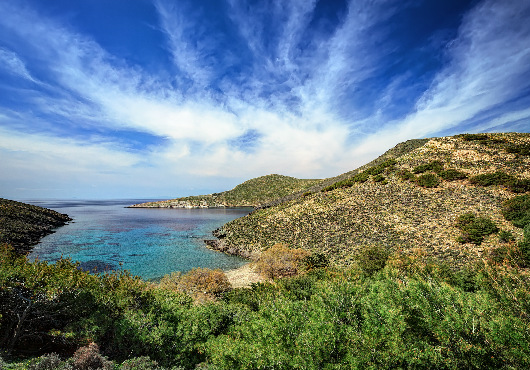 Renia, adjacent to Delos, has an isolated feel and makes for a pleasant escape if in the area. 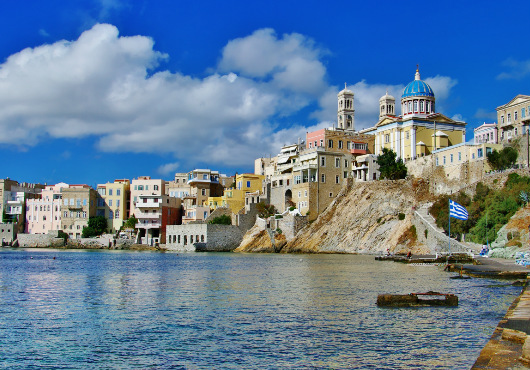 Continue sailing towards the south side of Syros where you will spend the night. Sailing back to Kythnos, sail past Serifos exploring the northeast part of the island. Continue sailing to the north part of Kythnos. Kythnos has very nice, serene bays for swimming. 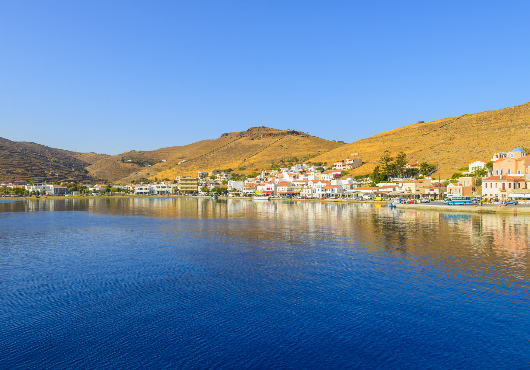 The town of Kythnos, Loutra, is famous for its hot springs which flow right into the sea. The small gulfs, which keep the sea peaceful, the white houses, the streets and the old windmills, are some of the attractions of this charming island. Spend the night there and enjoy your final evening onboard. After a relaxing breakfast with local products, continue sailing towards Lavrio. 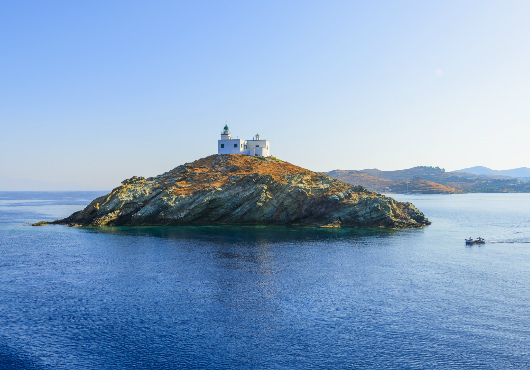 Sail past Kea and get back to the base where you will spend your last night!